What a wonderful evening we had in New York last Wednesday at the Museum of American Finance’s annual gala. This is always a great event, held to support an important and deserving institution, but this year I found it especially meaningful, as the museum used the occasion to honor me with its Charles Schwab Financial Innovation Award. Introduced just last year and named after my business competitor and friend Charlie Schwab (who quite appropriately was the award’s first recipient), the award is meant to recognize individuals who have introduced new markets or new financial instruments to our financial system. While I’ve never been one to seek out awards and testimonials, I’m enormously proud of the role TD Ameritrade has played in helping to make financial markets more accessible to everyone, and the fact that our peers in the financial-services industry have seen fit to recognize our contributions is a wonderful thing. The museum, of course, exists not simply to educate us about the history of American finance, but also to remind us of the absolutely essential role that finance plays in making possible the thing that makes America strong and prosperous – our system of free enterprise. That’s not to say there aren’t important lessons to be learned from our history. As I told the group in my acceptance speech, it’s worth remembering what gave us our start in the financial-services business: the 1975 deregulation of the commission structure, which ultimately made the stock market accessible to millions of small investors. Deregulation was a good thing then and I strongly believe it can be a good thing now. 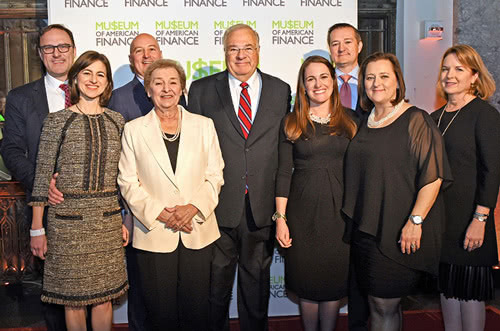 What made the evening at the museum particularly special was to be surrounded by so many dear friends and loved ones, including my wife Marlene, my children and their spouses, and colleagues from TD Ameritrade with whom I worked shoulder-to-shoulder through so many adventures. All in all, an evening to remember. It just doesn’t get better than this.